My workmate Selwyn recently wowed everyone in the office with her amazing chocolate macarons; a surprise raspberry hidden in the centre amongst the chocolate ganache. I immediately demanded her recipe and have spent a good few weeks tearing my hair out every time I removed batch upon batch of wrinkly chocolate biscuits from the oven but finally my tenacity paid off and I seem to have cracked it! I’m not entirely sure what ‘it’ is in the mastering of macarons but it seems my oven is uneven in its distribution of heat and so a few crinkles are still evident on the biscuits at far flung corners of the baking trays but they all taste the same. In my research I found some very useful templates courtesy of http://www.puregourmandise.com to place under your baking parchment to get uniform piped circles. Click here for small 3.5cm templates and here for medium 5cm templates. I discovered these saved time drawing round a shot glass and you can just slip the template out after piping and reuse. Weigh out the icing sugar, ground almonds and cocoa powder into the bowl of a food processor and blitz for 5 minutes or until the mixture is a very fine powder. In a large bowl, whisk the egg white and salt until it forms stiff peaks. Add the caster sugar little by little until the egg is stiff and glossy. Sieve the dry ingredients into the egg whites and fold quickly to incorporate. Keep folding for approximately 2 minutes until the mixture is smooth and shiny. The mixture is ready when your spatula leaves a ribbon like trail when held above the bowl. If the ribbon ‘snaps’ continue folding until a continuous ribbon of mixture drops from the spatula. Fill a piping bag fitted with a 1cm plain nozzle and pipe the mixture quickly onto lined baking sheets using the templates as a guide. 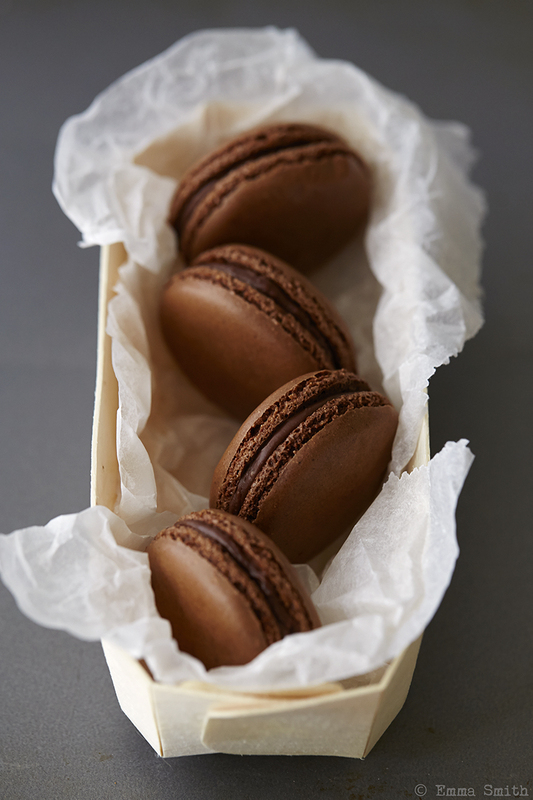 Set the trays aside for around 30 minutes so that the macarons can dry slightly and the tops become touch dry. Depending on your kitchen environment, this can take 15-60 minutes. While the biscuits are drying, preheat the oven to 160c or gas mark 3. Once touch dry, bake in the oven for 15-20 minutes until the biscuits base is just firm and reelable from the baking parchment. Once the biscuits have completely cooled, heat the cream in a small saucepan and then add the chocolate, stirring until the chocolate has melted. Leave to cool and once thickened, pipe the filling onto one of the biscuits, top with a raspberry of blackberry and gently sandwich with another biscuit on top. These taste better 1-2 days after baking as the filling softens the biscuit slightly. Store in the fridge in an airtight container for up to 5 days.